One of the lion statues outside the main branch of the library. Scan this QR code with your smart phone for a shortcut to this page. GLAMcamp NYC was a GLAM meeting/workshop for Wikimedians active in outreach to cultural institutions and modeled on the 2009 Multimedia Usability Project Meeting France. Rather than an open community conference like Wikimania, this was a workshop targeting a small group of community-focused and technology-focused Wikimedians to kickstart the key elements of the glamwiki.org project. Attendees also included key representatives of GLAM (and related) institutions who already had a strong relationship with Wikimedia. The meeting took place in May 2011, hosted by Wikimedia New York City and the New York Public Library. The hostel is just a few blocks from Central Park. Note: Expenses—including accommodation at the HI Youth Hostel, a reasonable amount towards the cost of travel, and a small per-diem—will be covered for attendees who require it, either by local chapters or the camp organizers. Venue: New York Public Library: "SIBL" building Friday-Saturday, Mid-Manhattan library on Sunday. Total number of attendees: approx 20–35. Grant: View the WMF grant application page here. (revolving doors) and give name to guard. Project start in September, runs for 8 months (project manager, designer, developer). Improved/standardised Commons documentation "how to do a bulk upload"
Goal & Timeframe - Liam explains "closing" ambassadors, Fae responsible for retasking the steering committee to a "GLAM International Support Team". Will help in regions when requested and defer to Chapter or current GLAM programmes when possible. Will assist with issues that fall between the cracks. Liam: Check in 1 month to consider GLAMcamp Europe towards end of 2011? A Better "share" system - especially including QRPedia codes, short URLs, and embed widget. Can we provide a place in the reference desk for professional librarians? GChriss. Might be able to offer crash space. 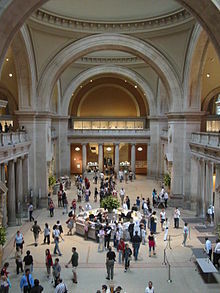 Metropolitan Museum of Art's grand hall. Brooklyn Brewery, yup, they make beer in Brooklyn! We are working on scheduling optional events for GLAMcamp attendees, more details coming soon! 5:45 pm - Meet in lobby of Met. This tour will be a great chance to explore the highlights of the Met in a short period of time with the very knowledgeable Susan Chun! New York is unlike any other American city - it's world famous, the heart of fashion, culture, music and art in the States. Bring a jacket or sweater, evenings are cool during May. Bring an umbrella. Rain is likely. This page was last edited on 24 July 2015, at 10:11.